Tariffs and Seasons for 2019: sleepss 16 – 24 pax. Prices per week. Sleeps 16 pers. 8 double rooms + 4 extra beds @ 50 euro per day per bed. + 2 extra rooms (4 pax per room) 3360 euro per room a wk. Peak Season weekly rate: June 2 – September 29 .- 32500 euro @ wk. Shorter stays, from 3 – 6 nights are available during low season on request. There is a security deposit of € 10.000 for phone & damages to be paid via credit card on booking the villa with your final deposit 60 days before arrival. On your departure this will be reimbursed minus any expenses incurred. On arrival there will be a € 2.000 advance payment in cash for food /beverage shopping. Beds : sleeps 24 pers. I have been strolling past this magnificent pink palazzo for over 2 decades and often wondered who owned it. Recently a friend purchased this wonderful property and today it is one of the most breathtaking villas on the Amalfi Coast. Constructed in 1741 atop one of the many Roman ruins of this region, this pink palazzo has all the trimmings of that era. 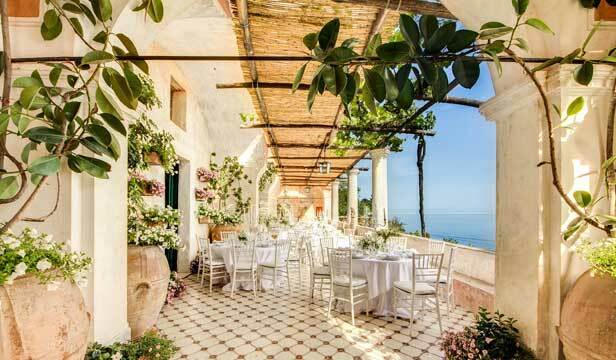 Beautifully frescoed dome ceilings, think walls to keep the heat and cold out and the perfect temperature in and breathtaking views of the Amalfi Coast, the island of Capri and the rich blue Mediterranean Sea. It now boasts a garden of apx 100 sq mts, 350 mts of panoramic terraces and an indoor space of apx 500 sq mts. This is a beautiful airy and generous property, it is the perfect villa for a special event with family and friends. A wedding, a milestone birthday or simply a relaxed family holiday. It is situated close enough to the hub of town to enjoy all the local restaurants, bars, shops and galleries – without being in the thick of the town. A gentle 10 mins walk down apx 150 stairs and along an antique pathway will allow you total quiet and tranquilly with some of the best views of the Amalfi Coast and it’s magnificent Mediterranean sea. 2 ‘family suites’ accommodating 4 pax per suite. Clients should at apx 4 pm. Later arrivals will attract a surcharge of 50 euro and there will be no check ins after 10pm . Please notify owner if you are aware of travel problems. Checkout time is before 10am on your day of departure. All train, flight and/or ship arrival details are appreciated on the time of booking. And mobile phone numbers are requested where possible to keep track of arrivals and departure. An advanced food supply can be organised prior to arrival with a 25 euro cash delivery fee to be settled on arrival plus the expenses of the delivery. E.g. breakfast food, wine, fresh bread, cheeses, cold cuts, coffee etc, so please make sure you let us know on booking if you require this service. 1) if the property is cancelled after the 30% deposit has been paid. 2) In case of cancellation within 4 months from the guest’s arrival another 10% of the total must be paid from the guests; within 3 months another 20% will be asked; within 2 months the 50% will be asked; within 30 days before the guest’s arrival the total amount of the stay won’t be refundable, the same will be for the last minute booking.